The websites, which generated with the acceleration of the internet era, have in time, become obligatory for companies. Today, the number of companies without a website is negligibly low. With time, as the technology developed further, mobile devices became widespread and that led the way to smartphones becoming one of the indispensable parts of our everyday lives. Then, the world of mobile apps has entered a rapid process of development too. Today, many companies, aside from a website, also have a mobile app to reach their users with. Also, many firms turn their website into a mobile app and allow their users access to their mobile devices. But what are the considerations for when turning a website into a mobile app? Turn your website into a mobile app. Why a mobile app? Web sites, e-mail, SMS, and mobile apps are channels the companies often use to form an interaction with their customers. However, customers do not perceive these as channels, but more like experiences regarding their relations with the company. A good mobile app may yield much better results than a website when it comes to user experience. How to ensure a perfect user experience? The mobile apps feature a different look and feel compared to pages on the internet, therefore the experience they provide to the users can be very distinct from other online channels. Keeping the simplicity at the forefront, creating a good first impression, emphasizing the brand value, using a consistent and beautiful visual language across the app, can all help with constructing a successful user experience. 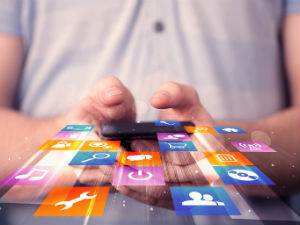 The mobile apps, which aren’t used without a mobile device, can help with overcoming issues that originate from user’s device or making the experience of using the app a better one. Therefore, when turning a website into a mobile app, creating a design where the user can complete their process easily and can use every page with a clear navigation can be a good approach. User meeting any difficulty when using the app, and having to spend a time to overcome this situation, may lead them to stop using the app. A mobile site or a mobile app? Device compatible (responsive) web design is an approach where your website resizes and reorder itself to fit the device it is being viewed on and therefore is designed to “fit the needs”. This design approach allows your website to be displayed a bit better on mobile devices, and make it more functional. A mobile app, on the other hand, is a software application you download from the Google Play Store (Android) or the App Store (iOS). Mobile apps, which perform relatively better on the mobile devices, can be designed to be separated from, but also to run integrated with your website. Mobile platform can also provide user engagement possibilities like push notifications and location-based actions, which can not be used on websites. If you also want to take your place in the still-growing mobile ecosystem, you can have your app easily with MobiRoller. Come and create your free MobiRoller account right now, and claim your spot in the app stores.